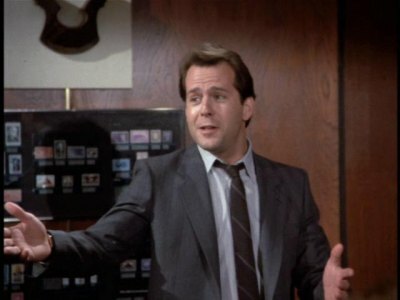 Do you remember the rakish, charming scoundrel from Moonlighting? Or the scruffy, world-weary, reluctant hero from Die Hard? What happened to those guys? I miss those guys. Especially when I see what we have now: a generic washed up action star. Where did it all go wrong for Bruce Willis? I’m never going to see The Expendables 2. I’m just not. I feel no nostalgia for Jean Claude Van Damme movies, and I get no kicks from seeing the aging Schwazeneggers and Stallones prancing around cracking canned one-liners while they shoot machine guns. Bruce Willis’s participation in said The Expendables 2 fills me with sadness. He didn’t have to come become a generic action movie guy. His filmography didn’t have to be filled with turkeys like Armageddon, Striking Distance, and a whole lot of terrible sequels. Every now and then, when Willis gets a chance to show his stuff, we see glimpses of the actor he used to be and could have been. He shows range, thoughtfulness and charm. And then he goes and cashes another five paychecks to make another five horrible films. Each of these moments offers Willis a shot at redemption and a chance to redefine himself — but he’s wasted each opportunity. After Pulp Fiction, both Willis and John Travolta had a chance to move into fascinating new phases of their careers and both blew it equally badly. Willis followed Fiction with the all-time-terrible North and the dreadful Color of Night. Given the right role, Willis is able to bring both gravitas and humor to almost any film. When he’s fully invested, he possesses a natural charisma that most actors only dream of. He’s not the first actor to chase big paychecks and sacrifice talent and quality (looking at you, Nic Cage), and he won’t be the last. But that doesn’t make looking back on his mistakes any less sad. Instead, he’ll be remembered as Sly Stallone.